Display of time by using the arrow multifaceted diamond polishing and rhodium plating. 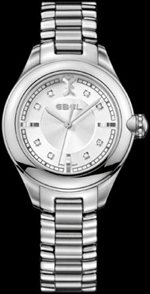 Sapphire crystal protects the dial with double anti-reflective coating. New Onde equipped with a quartz movement Quartz ETA 956.102 with the functions of hours, minutes and seconds.